The sun sets. Enjoy the view to the mountains of Apokoronas and the wonderful colours. Cherish the nature in the astonishing walking paths, and for those who wish, Eleonas guesthouse offers two mountain bikes to discover the paths of the village. After your walk, you can swim in the pool to relax. Manolis Chalkiadakis (Costis’ brother) is a professional physiotherapist and can offer you a relaxing massage. Eleonas offers natural body care products based on Elia (Olive). If you want to enjoy the Cretan cuisine, we propose you to choose among three selected dishes of the family. You can also accompany your meal with wine from a variety of Chalkiadakis family. 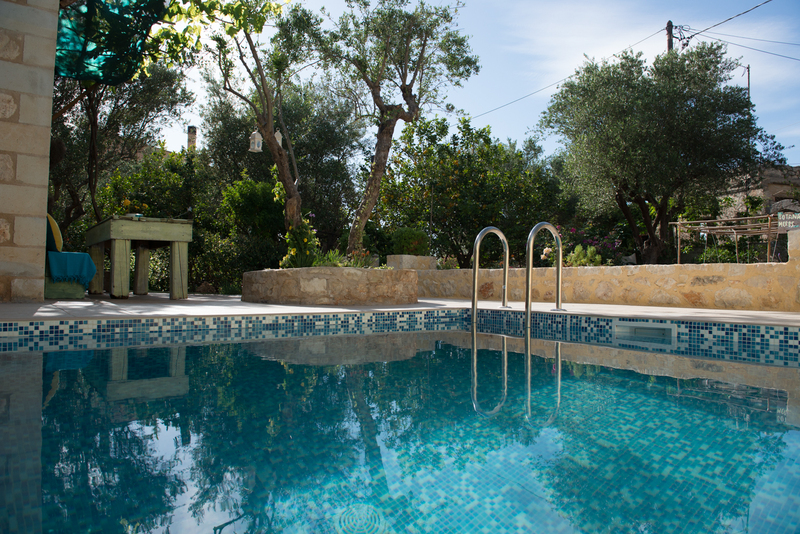 Spyridoula, mother of Costis, owner of the guesthouse will travel you to the secrets of the Cretan diet. All the products offered are home made. A fully equipped kitchen will meet your needs while the comfortable houses extended in two floors will make your stay memorable. The journey may be over, but we hope that the memories of your senses will keep it alive. Products from our garden will awaken your memories of your holiday in Eleonas. Relaxation: (Costis’ brother) is a professional physiotherapist and can offer you a relaxing massage.